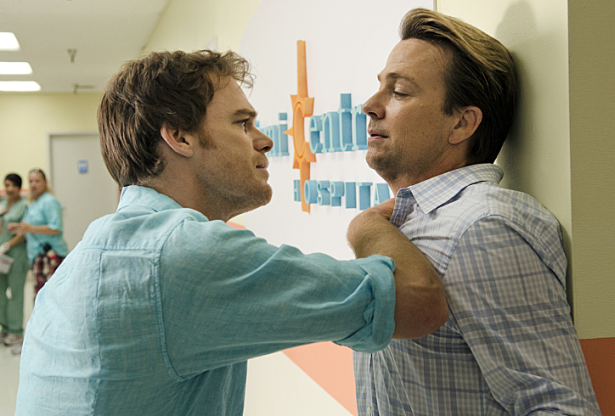 Last night, SHOWTIME said goodbye to its iconic drama series Dexter, and despite facing a competitive night of programming on broadcast, basic and premium cable, the Dexter series finale delivered the show’s highest-rated telecast ever and the biggest audience ever for an original episode in SHOWTIME history, besting the show’s season seven finale and season eight premiere. Dexter attracted 2.8 million viewers at 9 p.m. (up 13 percent from the season 8 premiere – vs. 2.5 million viewers, and up from the season seven finale – vs. 2.7 million) and 3.3 million viewers for the night (up from the season eight premiere – vs. 3.2 million viewers). Dexter continues to break records – with its eighth and final season on pace to rank as the series’ highest-rated season ever, a record which the show continues to break season after season. Season-to-date, DEXTER is averaging 6.4 million weekly viewers across platforms (up versus its seventh season, vs. 6.1 million). RAY DONOVAN ended its season ranked as the highest-rated freshman series in SHOWTIME history, outpacing the first season of HOMELAND by 33 percent. Last night, the season one finale of RAY DONOVAN delivered 2.1 million viewers for the night, the best finale night ever for a freshman series on SHOWTIME. The series garnered 1.41 million viewers at 10 p.m. (outranking its series premiere – vs. 1.35 million). Season-to-date, RAY DONOVAN is averaging 5.7 million weekly viewers across platforms, and now ranks as the network’s third highest-rated show, behind only HOMELAND and DEXTER.